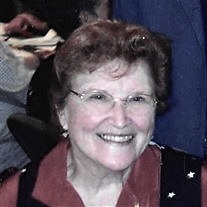 Peggy Marie Outman-Henshaw, 77, of Olathe Kansas passed away on the 15 of May 2015. She was preceded in death by her son Jerry Lee Outman, husband Charles Outman Jr., sister Mary Knepp, her three brothers Harris Edward, Jimmie and Larry, and her parents Jim and Inez Weeden of MillCreek IN. She is survived by her son Jim Alan Outman and his wife Joi of Olathe Kansas, four sisters; Lois Weeden of LaPorte IN, Annetta Gillooley of Dunedin, FL, Carol Miller of New Carlisle IN, Ula Godfrey of Cumberland City TN, and brother Mike Weeden of Rochester IN. Ms. Henshaw retired from her position as an accounting technician for the national weather service in January 2003 to enjoy gardening and her love of nature.